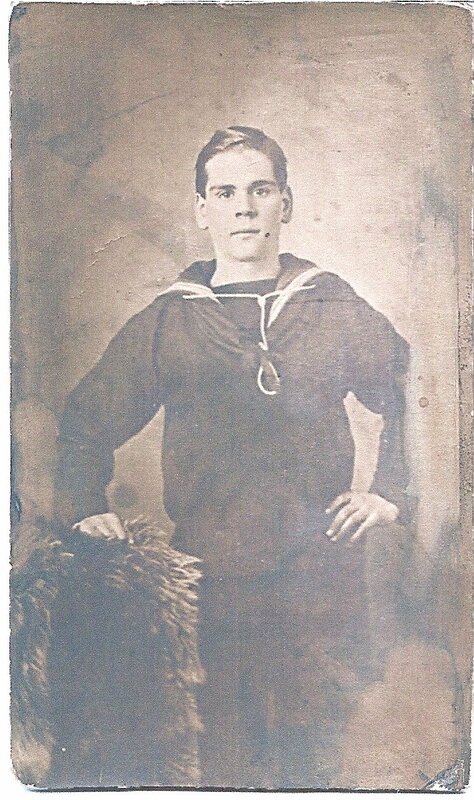 Bob was sixteen when he joined the Royal Navy as a boy seaman. Brought up in Newcastle-upon-Tyne, ships were as familiar to him as daisies to a country child. The acrid smell of the forges and the clangour of the riveters’ hammers were so much part of everyday life that most people didn’t even notice them, but Bob was fascinated. Anything to do with ships and the sea enchanted him and he had been determined to become a sailor for as long as he could remember. In June of that year the ship left Britain on a voyage to Russia carrying Lord Kitchener on a military mission. The story runs that also on board was more than ten million pounds worth of gold sovereigns en route to Tzar Nicholas II. It was hoped that the money would aid the Tzar’s resistance to his cousin the Kaiser and also help him to quell the threatening revolution in his own realm. The weather became increasingly stormy, with a N.N.W. gale blowing. Captain H.J.Saville ordered the two escorting destroyers to return to the mainland as the heavy seas prevented them from maintaining the speed of 14 Knotts. Two miles West by North of Marwick Head, on the N.W. coast of Orkney, at 7.40.pm., June 5th. H.M.S. HAMPSHIRE was mined. Far beneath the cold grey waves she lies, the treasure still guarded by Lord Kitchener and most of the ship’s company. U-boat U-75 on The 28th May 1916 laid the mine that sank H.M.S.HAMPSHIRE. Lieutenant Commander Kurt Beitzen was the commander of the U-boat. Twenty-one other mines were also laid on the same day in order to block one of the exits from Scapa Flow. The German High Seas fleet was preparing to leave harbour to prowl the North sea. The fewer British vessels likely to intercept them the more successful the Germans could be. Three rafts were lowered each bearing fifty to seventy men. There were fourteen survivors, two of whom died of exposure before they were rescued from the rafts. Those men who had climbed into the boats that were still positioned in their cradles disappeared when the ship did a complete somersault, sinking headfirst and turning over taking everyone, boats and all, down with her. 5th June 1916. Aged 20. All that’s left to remind us of Bob is a faded photograph and the medallion glinting in parody of the sunken sovereigns. A failed attempt to recover the treasure in 1935 ended when three divers were killed and two others injured. As the divers struggled to cut their way towards the gold a torpedo dislodged from the sunken vessel’s tubes narrowly missing their support boat. The Admiralty now strictly forbids diving near the wreck. 4. 1903 Cruiser of 10,850 tons built by Armstrong. Sunk by mine off Orkneys in 1916. Kitchener was drowned in the tragedy. Built by John Brown at Clydebank. During the 5th century A.D. the Saxons who eventually settled there and became known as the Anglo-Saxons invaded England. Northern Scotland and Wales managed to remain independent for several centuries but the rest of the island was eventually divided up into separate kingdoms such as Northumbria and Mercia. The southern kingdom of Wessex became increasingly more powerful than the others by incorporating smaller tribes such as the Germanic Jutes who had settled in Kent in the 6th century, the Celts in Devon and Cornwall and others from East Anglia and Sussex. Alfred, known as the Great, ruled over this powerful kingdom from 871-899 A.D., he was the overlord of England. He defeated the Danes who were an ever-constant threat and encouraged learning and writing in English. It is generally agreed that Alfred was the owner of the jewel known as the Alfred Jewel because it bears the inscription, ‘Alfred had me made’. The jewel was found in Newton Park near the Island of Athelney, Somerset in 1693. Its purpose is not clear although it is believed it may have been used as a pointer for following the lines of a manuscript. Somerset being then part of Wessex, which also included Hampshire, may account for the inscription on the jewel being used as the motto for H.M.S.HAMPSHIRE. Another reason for using those words could have been that Alfred founded the Royal Navy. The Alfred Jewel is now in the Ashmolean Museum in Oxford. On 29 May, 1916 he laid a 38 piece minefield with U 75 just outside the entrance of Scapa Flow. The very same day the HMS Hampshire left Scapa for Russia as the situation on the Eastern Front became critical and she was to play a crucial part in that. On board she had Field Marshall Lord Kitchener and his general staff. They were to turn the tide of the war in Russia. Only 10 miles outside Scapa Flow the armored cruiser ran on one of Beitzen’s mines in foul weather and sank in minutes, leaving only 14 survivors. Great-Britain’s most famous military leader and a legend in his own time was killed and nothing was to stop Russia from defeat and revolution. Beitzen later went on to command U 102, which was lost with all hands in late September 1918 in the Northern Barrage east of the Orkney Islands. The wreck of U 102 was located during a sonar sweep in 2006 and positively identidfied by divers in 2007. Struck a mine off Terschelling which is an island in the Northern Netherlands. 23 dead, unknown number of survivors. I hve recently taken possession of a badge belonging to my late father (James William Scott ex RN), this badge is from the HMS Hampshire with the Aelfred motto on the bottom. Your excelent article allowed me to learn the history and meaning of the phrase and the vessel. Pleased that my article was of help. My husband was also ex RN. Served on HMS Concord during the Korean War. Thank you for the comment. I have double checked and we are both wrong.It was U-75.